In honor of the first day of August rolling in (I’m sorry, where did summer go?!) I thought it would be fun to put together a little fall trend preview outfit! Oh the irony of writing this post while it’s a smoldering 90 degrees outside… what we do for fashion! ;) While I fully intend on ringing every last bit of summer out of August, I’d be lying if I said the allure of cool, fall mornings hasn’t already been getting to me. Something tells me that I’m not the only southern girl feeling this way! 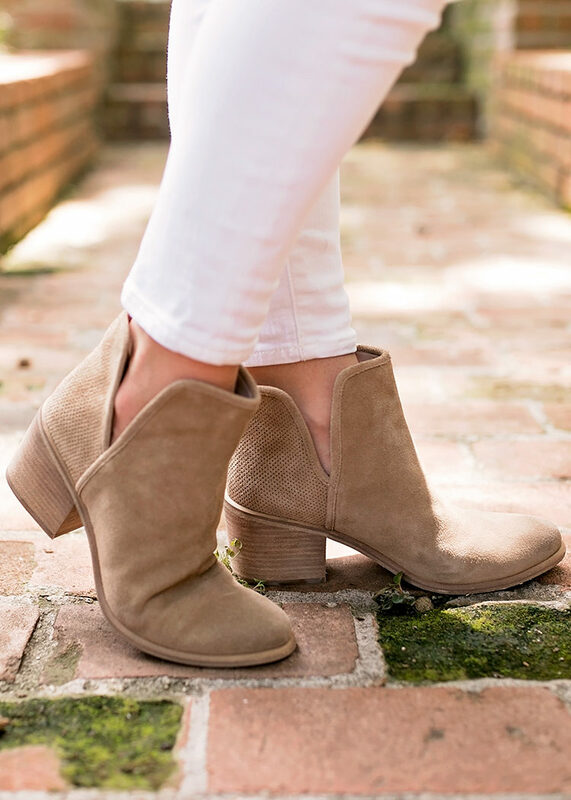 One thing I love about the Nordstrom Anniversary Sale is the peek it gives us into fall and winter fashion, and there were a few recurring trends I saw scattered throughout! 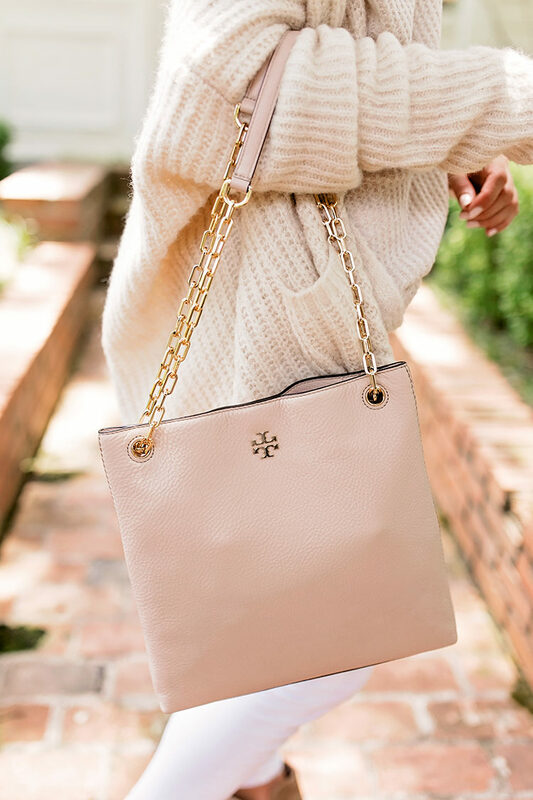 Blush // If there is one stand-out shade for fall fashion, it’s blush! From cozy cardigans to handbags and shoes, this feminine hue softly brightens up the darker colors more commonly associated with winter. Pair with whites and creams for a delicate, light look, or incorporate into navys and hunter greens for a pop of pretty. This is one color you can buy now and wear all year long. Bell Sleeves // We saw bell sleeves pop up this spring, and it’s safe to say they aren’t going anywhere this winter! From casual sweaters to cocktail dresses, this flourish adds a bit of fun to any ensemble. For maximum wearability, make sure the sleeves don’t hit past your wrist. If you’re petite like me, a quick (and inexpensive) trip to the tailor quickly solves bell sleeves that are too long! Suede // Something about suede feels so cozy to me, and I’m thrilled to see its being incorporated all over the place this fall. The material makes for a soft, refined alternative to classic leather. You’ll find it used for boots, jackets, skirts and handbags alike! Long Cardigans // All you ladies who love to layer, time to get excited! The long cardigan is sure to be a closet staple of girls everywhere this fall and winter. I already scooped up a couple from the sale, and have had so much fun mixing and matching them to create different looks. I recommend buying both a dark color (think black or navy) and a light (blush or oatmeal) for maximum versatility this coming season. Big Bags // While the classic cross body isn’t going anywhere, the star of this fall’s show is the big bag! Think hobos, satchels and totes… anything that makes a statement. Since I’m a chronic pack rat, I’m already excited at all the room this style gives! Needless to say, with so many fun trends on the horizon I can’t wait to see where my wardrobe takes me this fall. Don’t forget, the Nordstrom Anniversary Sale ends on Sunday, August 6th, and prices will go up at its close. Also, word on the street is that restocks are going live today, so if you’ve been pining away for a sold-out item, it’s worth re-checking to see if it’s back! Even though I’ll be sad to see summer end, I can’t wait for the cozy fall clothes that I get to wear. Those glasses look so cute on you ! Such lovely tips and trends for fall. I’ve been scouting for cardigans and this post came at a very good time. Yes! Fall trends would be what I need now! Visiting San Francisco and it feels like winter here! 😳 So cold!! Love blush tones! Thanks! I live in Texas too so I know about the intense heat. How can I adjust to the changing weather between being still too hot for a coat but not too cold for a big sweater. How on earth is it August already??! I keep asking myself that all day! I have loved the suede material for like forever so glad it is on fashion now and you really rock those glasses. Can’t wait for fall! I purchased two great sweaters in the Nordstrom that I’m so excited to style. I’ll just have to wait till it’s not 90 degrees out. Love you Kate!